Corey Blatchford has endured hardship that would break many. He served seven years as an Army combat engineer—“one of the crazy guys looking for bombs.” His wife Veronika suffered a miscarriage in 2010. He was medically retired in 2011 with a chronic shoulder injury and PTSD, then went on to work in a stressful position at the Department of Veterans Affairs. To cope with it all, he relied on the temporary comforts of food and prescription drugs, gaining weight and withdrawing from the world. Then he had a brush with cancer in 2012; his doctor told him that he’d need to change his life or possibly lose it. At this point Blatchford felt like he had let himself and everyone around him down. The cancer scare was the deal-breaker. “You don’t come home from 15 months of combat to be told you’re going to die from sitting on the couch,” he said. Into this bleak picture came a ray of hope: cycling. Blatchford (far left) will participate in Ride2Recovery this fall. Blatchford had tried exercising by lifting weights at the gym, but found it isolating and lacking in positive feedback. 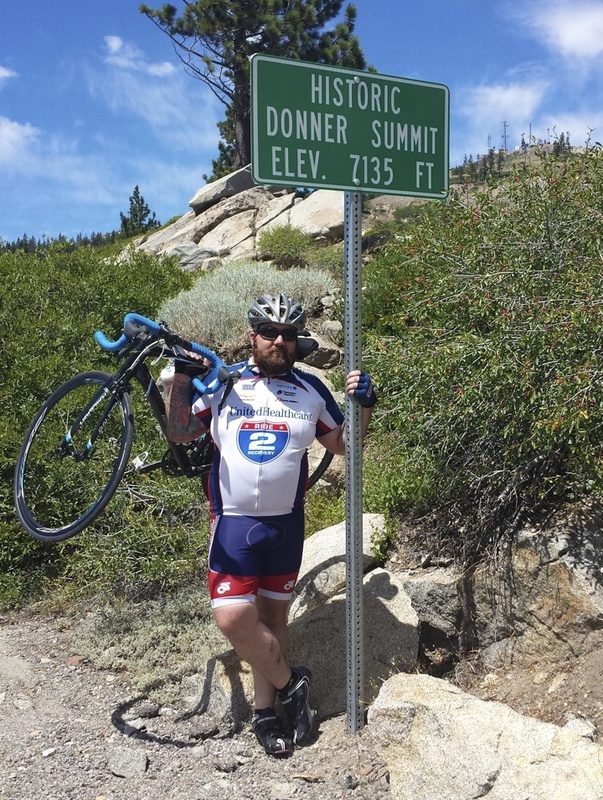 At a PTSD recovery program, he found out about Ride2Recovery (R2R), an organization with a mission to help veterans recover both mentally and physically via group rides and challenges. Blatchford used to race BMX growing up, and the camaraderie of R2R rides was attractive. Still, he had a ways to go before he could fully commit. Just after his cancer scare, he got in touch with April Wolfe, a local representative of Project HERO, R2R’s personalized coaching and encouragement program. “From day one,” says Blatchford, “she was like, ‘get on your bike, we’re going for a ride!’” Wolfe’s relentless motivation pulled him through the tough process of gaining fitness. At one point, things got to be too much and Blatchford tried to quit riding. “If you just get back on your bike, you’ll feel better,” Wolfe said. The advice worked. Cyclists riding 51 miles from San Simeon to Pismo Beach, Calif. during the 2013 Ride 2 Recovery California Challenge. 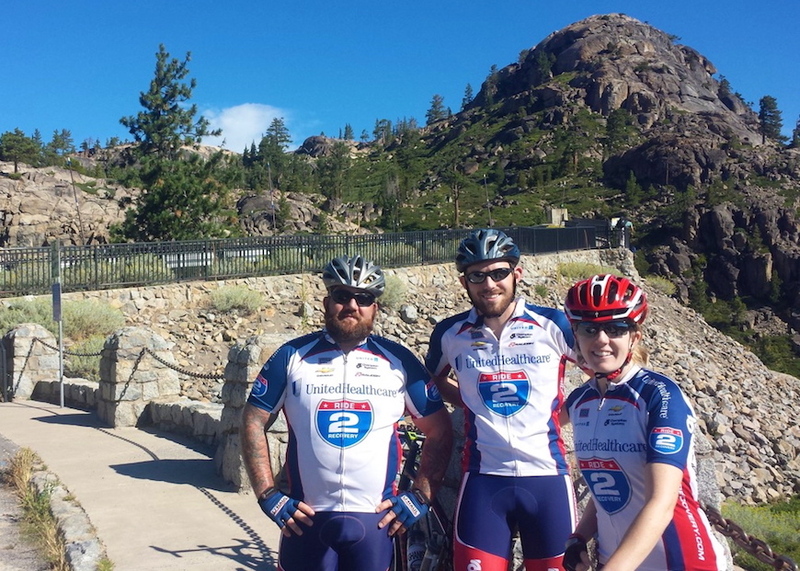 Image Courtesy of Ride 2 Recovery. Blatchford sporting his new Raleigh Revenio. The Blatchford family is expecting a child in September, and we wish them all the best. Raleigh is a proud sponsor of Ride2Recovery. You too can support the organization by donating or volunteering; go to ride2recovery.com to find out more.